At the start of this test you can select from a number of surface shapes that a dice can be unfolded into, those you would like to train in. Now, in each case, you will see an unfolded die and five ordinary dice. 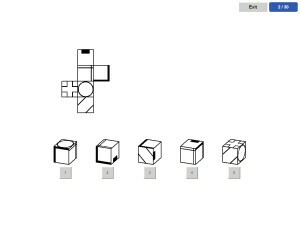 Your task is to select the ordinary die that would reproduce the shape of the unfolded one above if unfolded.